Established in 1891, Accrington Stanley played in the Football League between 1921 and 1962, when the club became only the second ever to resign from the League mid-season. The club went into liquidation in 1966. The new Accrington Stanley Football Club was born two years later though it would be a further couple of years before they began playing competitive matches again. 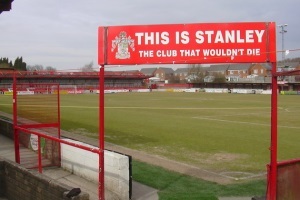 The new Stanley finally brought league football back to Accrington when they won the Conference championship in 2006.